The Eighteenth-Century has been a century of changes and conflicts, but also of technical and economic progress as well as huge social developments. All these different processes are mirrored in 18th century London: the centre of the new establishing Kingdom of Great Britain. There is no doubt that the eighteenth century cannot be analyzed isolated from what happened before and after it. For this reason we have to take a quick glance at the end of the seventeenth century. The Revolution of 1688-89, “The Glorious Revolution”, was significant for the future development of Britain. This event changed not only the man on the throne (James II was replaced by his own daughter Mary and his Dutch son-in-law, William of Orange1) but also the political system from an absolute monarchy to a constitutional monarchy. Moreover, the Parliament became established as the primary organ of government, which the monarch needed to collaborate with. The second major consequence of “The Glorious Revolution” was the protection of Protestantism as the leading state religion. In addition, Parliament passed a bill which made it illegal for Catholics to hold the throne. In the following decades this protestant supremacy was contested by several Catholics (e.g. Jacobite uprisings in 1715 an 1745) but never really endangered. Next to religious matters economic disputes played an important role in the 18th century. Through the Bill of Rights the Parliament gained control over the economy. Unfortunately, this directly led to a major financial breakdown, the so called “South Sea Bubble” in 1720. In return for a loan of £7 million to finance the war against France, the House of Lords passed the South Sea Bill, which allowed the South Sea Company a monopoly in trade with South America. Additionally, the company underwrote the English National Debt. As a consequence the shares immediately rose to ten times their value, speculation ran wild until the bubble finally burst. This new form of enterprise and commerce (stocks and shares) was mainly supported and controlled by one particular group of politicians: the Whigs. They supported Britain’s expansionist ambitions overseas, while their counterparts the Tories criticized this strategy because of the financial and human cost. The Tories were associated with the “old” landowning gentry class and therefore more interested in and supportive for the traditional landing economy. 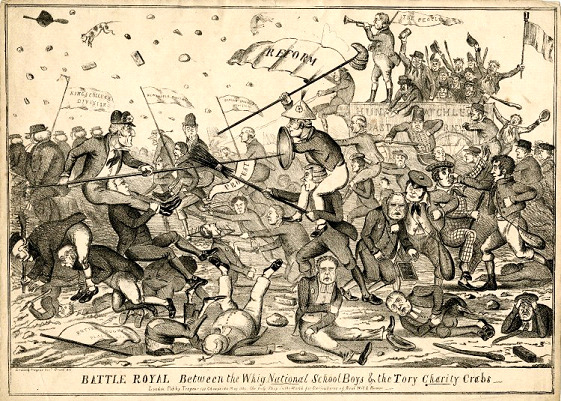 These two groups battled for most of the 18th and 19th century for political and economic influence. For this reason this essay will deal with important leaders, the main political ideas and the general development of the Whigs and the Tories. Two years earlier in 1753 J. Newbery released “A Pocket Dictionary” which also commented on those two terms. One might argue that Newberys` notes are more neutral or even more critical with especially the term Tory than Johnsons`. An excerpt from Mist´s Weekly Journal (7.10.1727) reveals the terminological ambivalence even more precisely than these dictionary entries. Nevertheless, Johnsons` and Newberys` descriptions are seen through the eyes of the 18th century but the original meaning is different. Although the term Tory had a negative connotation the Cavaliers adopted that name and bore it with pride. To begin with, one has to clarify the term party. The very conditions of party are phenomena of the modern world or to be even more precise of the modern state. Hence without nationality, a representative system, a considerable amount of individual freedom and some freedom of expressing opinion, parties can have no real or permanent being. The national states in Europe developed around the mid and late 19th century, therefore one cannot call the Whigs or the Tories parties in the modern sense. Instead the right term to use would be factions. Whigs and Tories were groups of people who shared the same political and religious believes. This cleavage showed itself first in the highest plane of life, that of religion. Till the Hanoverian age the Tories called themselves “the church party” or cavaliers. Their origin begins with the religious differences of Elizabeths` reign.8 From the first days of the Restoration English Protestants conceived two diametrically opposed interpretations of its purport – whether for the State, for the Church or for the individual. Religious unity had disappeared. Over the next decades the European Christian reform movement took place, establishing Protestantism as a constituent branch of contemporary Christianity. In England though, the Anglican Church played an outstanding role. The Church of England understood itself to be both catholic and reformed. Consequently the division came, then, not upon the relations of church and state, but on a prior question – what was the true Church of England? The Cavalier party members shared an ideal of church which hardly the most moderate Puritans could stomach. The firm discipline of Henry VIII (a Tudor) and Elizabeth imposed an authoritarian view which was to make the Anglican, and hence later the Tory, spirit. In the seventeenth century the development of the Tory party and also the Whig party went hand in hand with several striking contrasts: Cavalier against Puritan, Renaissance against Reformation, Catholic against Protestant, or free-thought against dogmatism. Catholics formed no insignificant part of the Royalist armies. The fortune, even the existence, of old Catholic families depended on the Crowns` leniency. Moreover this dependency has been the most important reason for their invariable loyalty. In 1625 the reign of Charles I. began. He was a supporter of the counter-Reformation and it was therefore not surprising that a stream of conversion took place. Even a few members of his Cabinet converted to Catholicism. These Catholic recusants gave men and money freely at their sovereign`s call for the Scottish and the Civil Wars. Charles I. really needed this backing, because of his constant struggle for power with the English Parliament. The Cavaliers were the supporters of Charles I. in the English Civil War (1642-1651). The Civil War consisted of a series of armed conflicts and political machinations and was the consequence of the dispute between Parliament and King. During this time the Cavaliers generally referred to themselves as Royalists, a sign for believe and trust in Royalty. Furthermore the ancient folk-religion of the people, the counter-Reformation and the classical Renaissance were the chief spiritual influences of the Royalist. Unfortunately for the Cavaliers they were defeated by the Parliamentarians and Charles I. was executed in 1649. But they did not have to suffer long from the replacement of the English monarchy through the Commonwealth of England (1649–53), and later by a Protectorate (1653–59), under Oliver Cromwell. Shortly after Cromwell died 1658 and a restoration process of the English monarchy began, which set Charles II. on the throne. Nevertheless, since the end of the Civil Wars the English monarch could not govern without Parliament's consent. This reform was not easy to deal with for a Royalist, since they saw sovereignty as residing in rulers and viewed the people as subjects whose duty is to obey. 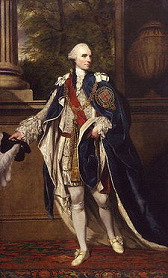 As political labels, the terms Tory and Whig derived from the factional conflict of the Exclusion Crisis (1679-81), Whigs being supporters of Exclusion (of the Catholic James, Duke of York, brother of the king and next in line for the English throne) and Tories being their Royalist opponents. There were two Tory ministries under James II; the first led by Lord Rochester, the second by Lord Belasyse. For a complete understanding of the situation it has to be mentioned that the history of the party was never more intricate than between 1690 and 1694. An active King was determined to rule above party. The Revolution had shattered the old Tory basis and largely destroyed the rationale of the Whigs. The first were drawn by their political reason to support the Crown, but by their sentiment to hate usurpation and Dutch wars (a series of armed conflicts between 1652 and 1784).11 Purely religious scruples were losing their strength and were absorbed in the factious political system. Moreover, the existence of party politics was not yet accepted by old-fashioned and loyal country politicians: their constitutional ideal was still a king ruling over a united House of Commons. The period around 1700 can be described as experimental. The King reluctant to abandon his freedom of choice and only anxious to secure his power freely experimented in his selection of ministers. 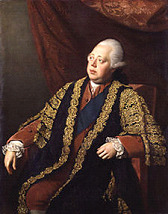 Whig and Tory politicians changed seats and influence constantly. A political turnaround was the death of Queen Anne, the last of the Stuarts. From now on a new house ruled over England. The Hanoverians took over and with them the Whigs monopolized power. After a period of political realignments in the middle part of the century, the terms had shifted around somewhat again by the late eighteenth century: A Tory was a "conservative," a supporter of the status quo with its various privileges and exclusions, while a Whig was a "liberal" or "reformer," committed to modernizing the system of church and state. In the late eighteen century the label "Tory" can be applied to the Prime Ministers Lord Bute (1762–1763) and Lord North (1770–1782), though it is difficult to trace a continuous "Tory Party" through the eighteenth century. These latest inflections stuck through much of the nineteenth century. During this period of time Tories or Conservatives opposed Catholic Emancipation, electoral reform, and Irish Home Rule. Subsequently, the term Tory has survived as a label for a conservative or reactionary political outlook. The fact that today a coalition of the Conservative Party, founded in 1834 out of the Tory Party, and the Liberal Democrats, which descended from the British Whig Party, are the ruling parties of the UK since May 2010 is very interesting. 1 Goring, Paul: Eighteenth-Century Literature and Culture. London: Continuum, 2008. S.5. 3 Müllenbrock, Heinz-Joachim: Whigs kontra Tories: Studien zum Einfluss der Politik auf die englische Literatur des frühen 18. Jahrhunderts. Heidelberg: Winter, 1974. S.13. 4 Müllenbrock, Heinz-Joachim: Whigs kontra Tories: Studien zum Einfluss der Politik auf die englische Literatur des frühen 18. Jahrhunderts. Heidelberg: Winter, 1974. S.13. 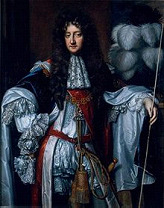 5 Charles II was monarch of the three kingdoms of England, Scotland and Ireland. He ruled from 1660 till his death in 1685. 6 Heinz-Joachim Müllenbrock: Whigs kontra Tories: Studien zum Einfluss der Politik auf die englische Literatur des frühen 18. Jahrhunderts. Heidelberg: Winter, 1974. S.14. 7 Keith Feiling: A history of the Tory party 1640-1714. Oxford: Clarendon Press, 1924, S.24. 8 Elizabeth ruled from 17 November 1558 until her death in 1603. Heinz-Joachim Müllenbrock: Whigs kontra Tories: Studien zum Einfluss der Politik auf die englische Literatur des frühen 18. Jahrhunderts. Heidelberg: Winter, 1974. John Barnes: A history of the Conservative Party. London: Longman, 1978. Keith Feiling: A history of the Tory party 1640-1714. Oxford: Clarendon Press, 1924. Linda Colley: In Defiance of Oligarchy, The Tory Party 1714-60. Cambridge: Cambridge University Press, 1982. Maurice Wodds: A History of the Tory Party in the seventeenth and eighteenth centuries. London: Hodder & Stoughton, 1924. Paul Goring: Eighteenth-Century Literature and Culture. London: Continuum, 2008.